BCDB Rating: 3.4/5 Stars from 4 users. This page has been viewed 75 times this month, and 5707 times total. Cartoon Characters: Tony, Pete, Frankie, Louie, Bella, Zalmie, Eva Tanguay, Crisco, Benny, Hannele, Palumbo, Nancy, Leo Stern, Little Pete, Izzy, Beat Poet, Theatre Owner, The Blonde, Dwayne, Little Zalmie, Halley, Young Zalmie, Club Manager, August, Space, Johnny, Reed, Jeffrey, Tuba Player, Freddie, Little Benny, Young Benny, Tony's Brother, Tony's Sisters, Stagehand, Hippie, Curtis, Punk Singer, Punk Drummer, Punk Rocker, Punk Guitarist, Organ Grinder, Doorkeeper, Piano Player, Announcers - Various, Singer in Raided Nightclub, Prostitutes, Showgirls, Hobos, Crapshooters. Produced By Ralph Bakshi, Martin Ransohoff, Lynne Betner, Maggie Abbott, Richard R. St. Johns. Editor: David Ramirez, Michael A. Stevenson, Scott Burrow, Martin Cohen. Originally Released on February 13, 1981. You can watch this cartoon today on your computer. 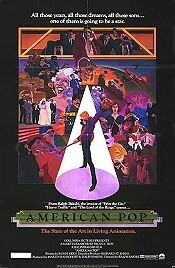 Just click below to start viewing "American Pop" online now. Do you have anything to add to this page? Have we made any mistakes... or do you have any additional information about American Pop? If so, we would love to hear from you. Please send us a quick note with your additions or corrections to this page, and we will make the corrections as soon as possible! Below are comments about this cartoon submitted by people who have seen this show. Take a look and see what others have said about American Pop. We want to know what you think, too!! Feel free to share your own opinion- we do want to hear from you! You can add your own comments here. I have never been a big fan of Bakshi's cartoons.... and they looks even more dated now. 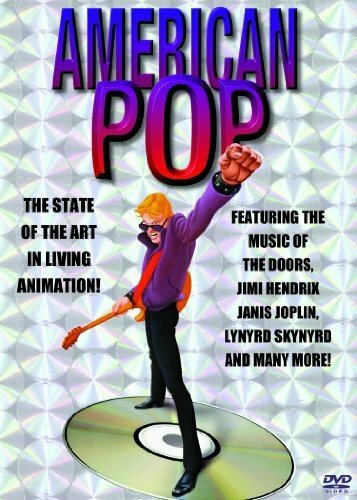 American Pop by Big Cartoon DataBase is licensed under a Creative Commons Attribution-NonCommercial-ShareAlike 4.0 International License.